Early in April, my sister from Australia came to visit to escape partying around her 60th birthday down-under. She brought with her my two nieces, one partner and two grandchildren (3 and 8 months). My two children with a partner also came to see their cousins and aunt, so the house was full and cracking at the seams. We had a lovely time over the three weeks they were here, although my sister was not too happy that no-one questioned when purchasing her first wrinkly ticket!! Needless to say there has been no time to paint and I have been itching to get down into the peace and quiet of my studio at the bottom of the garden. It was of course already occupied! However I did escape for for two days and one night. I spent the time at Goodnestone Park Gardens. But more on that in a separate blog. The weather as you know has not been typical of April during their visit, although it is a little warmer than when they arrived. We did all get hefty colds in trying to appear tough and hardened Englishmen. On Monday my children went back to Amsterdam, where they both live presently, taking with them one of the cousins and her partner. 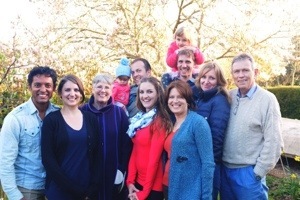 Today my sister and her other daughter and grandchildren returned to Australia. The house is amazingly quiet! < Crab apple blooming delayed by cold!